Oriental Rugs & Carpets Auction | The Collection of Grover Schiltz | Skinner | Skinner Inc.
BOSTON, MA – March 10, 2014 – Skinner, Inc. is pleased to announce an auction of Fine Oriental Rugs & Carpets, antique textiles, Kashmir shawls, and Central Asian embroideries on Saturday, March 22. This wonderfully curated offering of eclectic and rare pieces marks the debut auction of Lawrence Kearney, Director of Fine Oriental Rugs & Carpets. Mr. Kearney comes to Skinner with a distinguished background in the world of textiles, as a well-respected dealer of more than 30 years, and in letters, as an American poet of note. He is assisted by Erika Jorjorian, a textile artist with academic training in applied arts and art history. “Many of the offerings in this auction not only demonstrate tremendous artistry, they possess great value as decorative pieces and are historically compelling. It’s like an opportunity to purchase a small piece of the Silk Road,” said Kearney of his debut sale. The auction begins with 47 rugs and textiles form the Grover Schiltz collection, which are offered without reserve, and represent 50 years of inspired collecting. This extensive assortment is informed by Mr. Schiltz’s taste for exceptional, artistic pieces, and most are in original condition. An indicative piece from the Schiltz collection is the Soumak Long Rug (Lot 28, $2,000 to $2,500), a rare, well-preserved mid-19th century rug reflective of an earlier design tradition. Superb folk art elements are featured alongside a conscious use of space and a scarce, light green field color, punctuated with ivory, gold, red, deep blue, and salmon. The Schiltz collection also includes a number of wonderful central Asian embroideries, including a mid-19th century Nurata Suzani, with an intricately drawn allover floral design (Lot 43, $2,000 to $2,500). An early 19th century West Anatolian Bergama Rug (Lot 101, $6,000 to $8,000) is a beautiful throwback to 17th century design with madder field, surrounded by an unusually wide border. The sale also features a number of exceptional Kazak rugs, including a mid19th century green field Karachov (Lot 158, $12,000 to $15,000) and an ivory field Bordjalou in excellent condition with superb color and dynamic design (Lot 105, $5,000 to $6,000). One of the top lots of the sale is the well-preserved, as-found, mid-19th century Bakshaish Carpet from Northwest Persia (Lot 121, $15,000 to $18,000). This unusually small carpet (7 ft. 2 in. by 6 ft. 1 in. ), with numerous silk highlights features a large, powerful, light blue medallion on an ivory field. 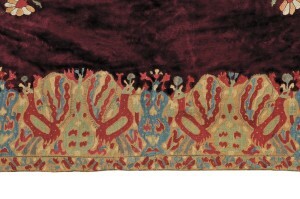 Such extensive use of silk is rare for a rug from this region, suggesting it may have been a piece commissioned by a local notable. 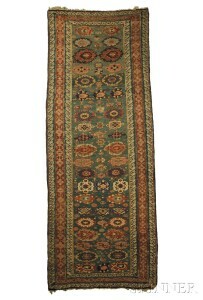 Also noteworthy is a late 19th century Antique Serapi Carpet (Lot 123, $10,000 to $12,000). Significant both for its sought-after square shape and archaic design, it features large blocks of color and spare decoration. The sale includes over 35 additional Persian carpets including an Antique Fereghan Sarouk Carpet (Lot 125, $6,000 to $8,000) c.1900. A standout amongst the smaller Persian rugs is a very old and finely woven Halvai Bidjar (Lot 120, $800 to $1,000). Also featured is an 1830’s Kashmir Moon Shawl, (Lot 132, $2,000 to $3,000), highlighted by the circular center medallion inset with a pattern of hooked vines and flowers upon an ivory field. 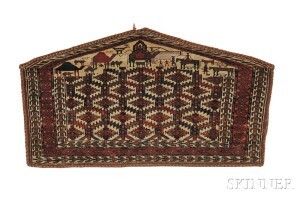 Skinner, consistently offers quality material in this category, and holds the record for the sale of a moon shawl at auction, having sold a Kashmir Moon Shawl in 2012 for $59,250. Previews for the auction will be held on Thursday, March 20, from 2 to 5 P.M., Friday, March 21, from 2 to 7 P.M., and Saturday, March 22, from 9 A.M. to 10:30 A.M. A Gallery Walk will also take place on March 21 at 6 P.M. Illustrated Catalog #2713B is available from the Subscription Department, at 508-970-3240, or from the Gallery. Prices realized will be available online, at www.skinnerinc.com, both during and after the sale. The Skinner website enables users to view every lot in the auctions, leave bids, order catalogs and bid live, in real-time, through SkinnerLive! Skinner auctions draw international interest from buyers and consignors alike, with material regularly achieving record prices. The company’s auction and appraisal services focus on fine art, jewelry, furniture, and decorative arts from around the globe, as well as wine, fine musical instruments, rare books, clocks, Judaica, and more. Monthly Skinner Discovery auctions feature a breadth of estate material. Widely regarded as one of the most trusted names in the business, Skinner appraisers have appeared on the PBS-TV series Antiques Roadshow since the show’s inception. Skinner has galleries in Boston and Marlborough, Massachusetts, with an international audience of bidders participating in person, by phone, and online through the SkinnerLive! online bidding platform. For more information and to read our blog, visit the website at www.skinnerinc.com, find us on Facebook at https://www.facebook.com/skinnerauctions, or follow us on Twitter @Skinnerinc. This entry was posted in News and tagged anatolia, auction, carpets, caucasian rugs, central asia, embroidery, greek, kashmir, kazak, Lawrence Kearney, moon shawl, oriental rugs, persian carpets, persian rug, prayer rug, room-sized, rugs, serapi, textile, turkestan, turkmenistan by Skinner. Bookmark the permalink.